Memorial program is the another noun of funeral program or event that is organized or called upon by the mourning family-members of a deceased person. Funeral is one of the most important occasions of a person’s life cycle. In many religions, it is believed that the spirit of deceased does not actually rest in peace, if it has been cremated righteously. The members of the family of invite the near and dear ones of the deceased at the memorial program to give a life tribute to him or her. Generally, relatives, friends, colleagues, neighbors, etc. are invited to attend the memorial or funeral program. To invite people to above explained program or event, memorial cards are sent to friends and relatives of the deceased person, who left the world because of the consistent decree of the nature. The card conveys the poignant letter of the unexpected exodus of the person. It conveys the shocking and heartbreaking information about the death of a person; thereby, it is presented in simple and sober manner. The memorial card, when it is incomplete or displayed as sample is pronounced as memorial card template or funeral card template. To invite the near and dear ones of the person, who has departed, the members of his or her family send an invitation card to them. An invitation card carrying the sad news of the sudden death of a person can be referred to as memorial card. Memorial cards are very simple in design, and have an elegant and decent appeal. It is designed so mindfully, that the cover page of the card itself indicates the whole story. The sample of memorial card is pronounced as memorial program template card. Every card shop has card samples, which are shown to the buyers, when they visit the store, looking for suitable cards, to be sent to the invitees. Checking out the sample cards helps buyers make out how their chosen card would look. Memorial program templates are pre-designed cards that can be personalized as per buyers’ specifications. 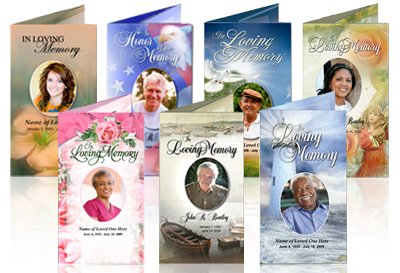 There are two options or places, where you can buy memorial card; the traditional card shops, and online stores. When buying cards from a local store, there is only one advantage, and which is you can touch the sample card for real, and check out their real color, size and other properties. It takes a great sum of your high-valued time. Specially, if we talk about the occasion, for which you are going to buy the card, you do not really have that much time. To get the things accomplished instantly, you need to follow the modern way of card buying, which is online, from a website over the internet. Because it is easy and less time taking! People hardly get enough time to arrange everything properly for the funeral or memorial program. It seems like an uphill task choose the memorial card, get it printed, collect it from the store, and send it to the invitees on time. But if one chooses to buy the card from an online store, the time saving ball is in his court. Websites can be accessed anytime, anywhere by anyone. If you have time, you can find a suitable card; if you do not have that much time, you can take some help from some other member of your family. 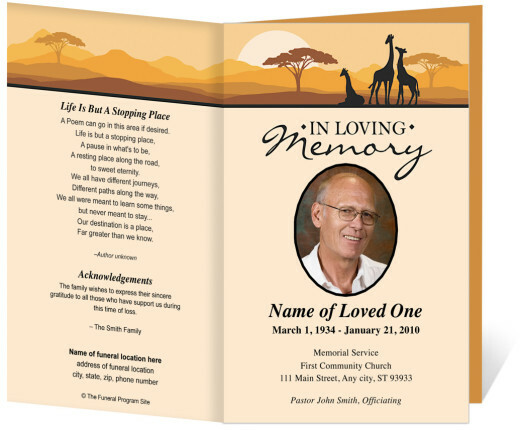 You at first need to find a few websites that sell memorial program template online. After that, you should check out their selection of cards and their prices; you have to pick the website that has cards that match and fit into your requirements. Once you have reached the website that meets your requirements, close all the other tabs and try searching for a suitable card for the funeral program. If you have found that, you need to customize it with your texts, images, and specifications, like venue details, address, etc., and save the card by signing up on that website. After saving, you will be asked to make the payment, after which they will allow you to download the card. After downloading it, you can take the print, place each card in an envelope, and invite the attendees of the event. 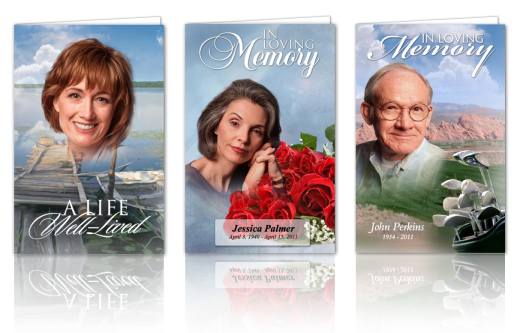 The best advantage of buying memorial program templates online is that it saves your time. It is really a great relief during the stressed moment, when you do not have time for making all the arrangement for the funeral event, and you have to take care of the invitation cards as well. It is paramount to choose a decent looking, elegant card for the memorial event. The card should be elegant and simple, which seems really difficult when you are stress and saddened over the passing away of your loved one.